I’ve tested a bunch of electric bikes on the beach and I’ve always found the same problem. 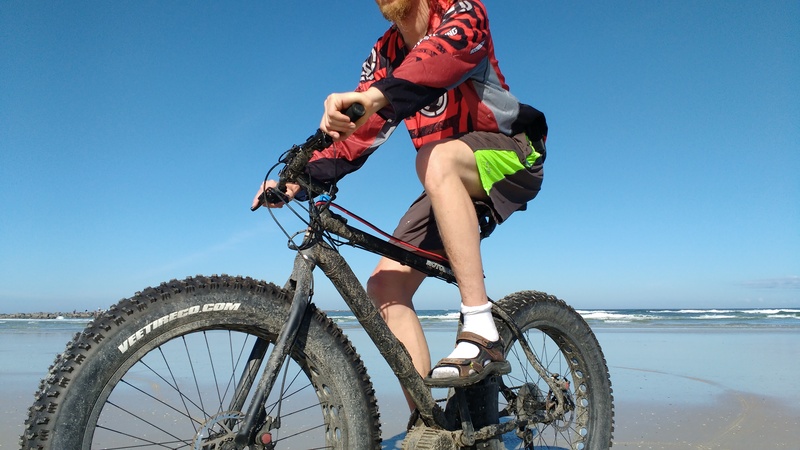 Ebikes generally work great on the hardpack but get bogged down in soft sand to the point of being basically mostly unusable. 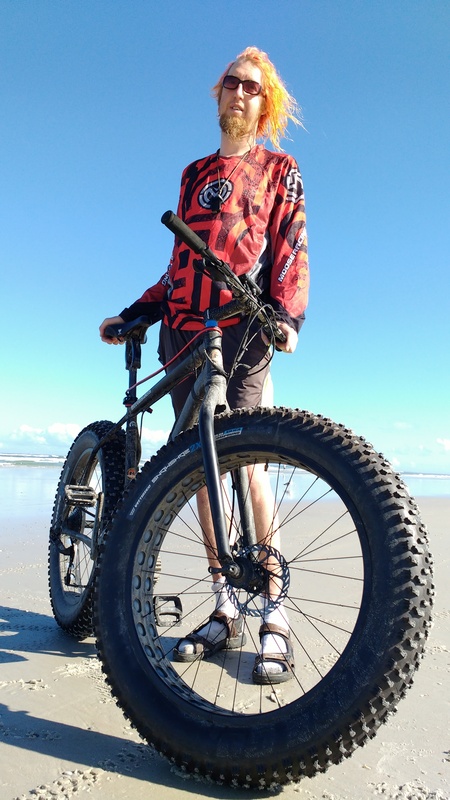 I took a trip down to Florida for 2 weeks and dragged along my Phat Phuk build which sports massive 5.05 inch Snowshoe 2XL tires. It did great on the hardpack as I expected it to, but it’s performance in sand that was so soft it would have gotten a Humvee stuck, my 5.05 inch tired Phat Phuk & BBSHD combo blew me away. 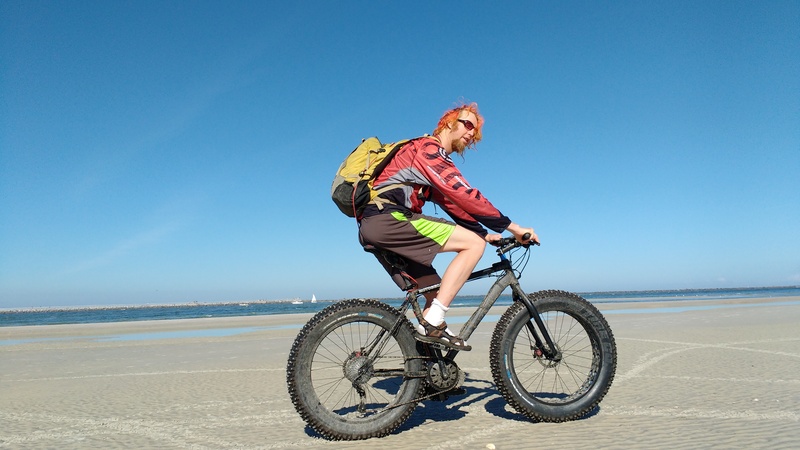 A beach bum and his ride, the ultimate beach cruiser for all sand conditions. Note the sandals and socks, the number one male fashion faux-pas. I ran the Phat Phuk with a tubeless setup with 5 psi in the front and around 7psi in the rear. I felt like you could go even a little lower than that as on the beach you don’t have to worry about bottoming out the way you would when trail riding. The front rims are 100mm and the rear is 80mm and performance should be similar regardless of the frame you are riding. I tested this bike in two separate locations with 2 different conditions. On the hardpack beach of New Smyrna beach in Florida and on the incredibly soft sandy trails of Wekiwa Springs State Park, home of the Manatee springs. Wekiwas was a pretty darn cool place where you can Standup Paddleboard right up to manatees chilling out in the reserve. The bike trails basically sucked and were so soft that our normal bikes quickly got bogged down and could just not move at all. The Phat Phuk took it all in stride without missing a beat. Normally trail riding with the BBSHD the unit hardly ever breaks 120 degrees Fahrenheit in the controller, but in the soft sand on full throttle, it quickly got up to 140 F which is my usual shutoff point for the BBS02. The BBSHD has a much wider power range and delivers a lot more power at lower RPM’s and pedal cadences than the BBS02. That being said under high loads like incredibly soft sand the BBSHD still wants to be driven at a much higher RPM speed in order to keep motor temperatures down. The BBSHD also seems to shed heat much faster and I was able to drive the motor at 140F for quite a while and the windings didn’t melt. Keep in mind that is the controller temperature with a cheap probe siliconed in so the motor temps were probably running a lot higher than that. The controller probe is there to give you a better idea of what is happening in the motor (is it getting hotter, is it cooling off, is it staying the same?) and not the exact temperature. This bike did actually really well on the hardpack even without the motor even running at all. A real workout. The BBSHD with the monster 46T factory paperweight that Bafang calls a chainring wanted to be ridden on the larger granny cogs in the rear. In the soft snow once I got up to speed the tires just seemed to ‘float’ on the sand and if I could shift into a higher gear and keep my momentum up then I could scream along at a pretty good clip. Sand got flung everywhere including onto the chain and the drive unit made some very strange noises when I pedaled but I was having so much fun I didn’t want to slow down to figure it out. The front tire would tend to follow the ruts that previous vehicles had left in the soft sand but it was quite easy to drive the bike up out of the ruts with enough speed. The huge tires produced a lot of rotational momentum which added to the stability and the rubbing of the tire on the front fork at 20mph and faster was so loud that people could hear me coming from a long way away. Ironically the rubbing tire at high speeds sounded a lot like a gasoline motor. Expect to spend most of your time in the soft sand on the bigger granny gears. Once you get up to speed you can drop into the higher gears. When riding the bike on hard pack it could easily hit 30 mph or faster with the BBSHD. This is mostly due to the fact that the diameter of the 2XL tire is insanely large and acts like having a much larger front chainring than you actually have. The fat tires and not that useful on hardpack, as we were running a 700C non-electric road bike with a 1-inch wide tire and it did just fine on the hard pack. The soft sand is where this build and motor really shines, as any ebike will be fine on hardpack. This little baby will easily top 30 mph without breaking a sweat on the hard pack. I kited in this inlet a bunch of times with the dolphins and it was pretty awesome. Florida in winter is a real kiter’s paradise. The biggest problem I saw other than heat was the sand and saltwater getting everywhere. Any exposed steel parts on your bike are going to quickly rust with the salt water and the sand will make short work of any chain. I don’t have answers to those issues although a belt drive with an IGH might be a better solution. The BBSHD was built expressly for heavy-duty applications like running through soft sand and paired with the Snowshoe 2XL is totally up to the task. 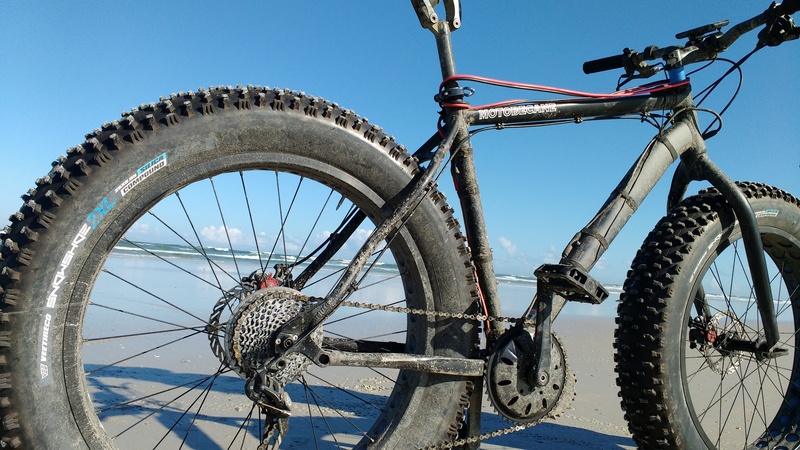 If your beach looks like this then you’re going to need a setup with fat tires and a hell of a lot of power. Stellar. Good to hear that the BBSHD is able to shed heat under low rpm loads well enough while we wait for a smaller chainring. I like the socks, better with Birkenstocks, but judging by the pictures the model isn’y a fashionista! I’ll take the motor apart and see if any sand got inside. I plan on replacing the black grease with some Mobilgrease 28 which looks like it will work much better and still be nylon gear safe. wow such nice pictures….did you get a new camera or something? Get a new sidekick? Hey what about the hair…is that a new cut? All looks awesome. Yeah my 6 year old smart phone with a broken lens and a mostly non-working screen got upgraded with a Moto G which is waterproof and sand proof. It’s funny because some of the pictures on the site are taken with the wifey’s $10,000 digital SLR (she is a professional photographer) and some of them are taken with my old crap smartphone. The new phones are amazing picture quality for sure. awesome…it will really make a big difference on the site if you keep it up and dont break this one ….this story has an exciting feeling….makes me want to go out and ride. Built this bike fashioned after yours for a friend and he loves it. Just curious what Battery are you using in that backpack for power. Great work! My batteries are all LifePo4 but I have some new chemistry coming this Fri. I am nervous about my house burning down so I’ve experimented with a lot of other batteries but as of right now LifePo4 is all I use. That is going to change. Interesting call on the Mobilube 28: I used an awful lot of Mobilube 25 greasing helicopters in both of the Oil Gulfs. I can still recall the sort of cherry smell it had as well as the distinctive red color. It certainly worked just fine on rotor heads and rod end bearings, the gearboxes all used oil. 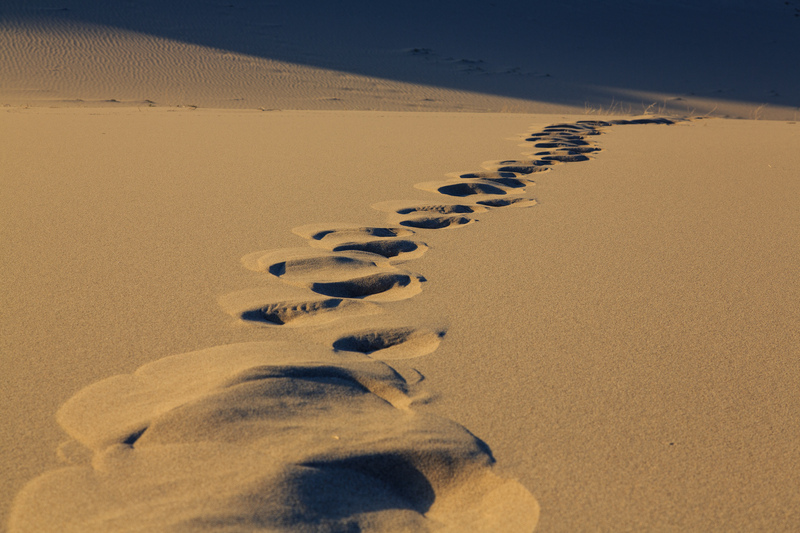 How many miles on soft sand could you get with the battery pack? What do you think of using a modified Bob trailer to carry battery pack(s)? Did the sand/salt get on the discs and/or calipers. If so, do you think those parts would be damaged over time? Soft sand eats up an insane number of watts, I’d say that you have to burn at least 20amps cont so do the math. A 10Ah pack would be burned up in 30 minutes. The salt water rusted the disks pretty good. I think you would have to replace them pretty often. Good stuff. Read this while searching for some chatter on wheels. Any good wheel comparisons around? Plans for grease in the BBSHD? Oh to be young and have hair! Tons of reviews in the Tires section, I will grease the BBSHD the next time I tear one apart. Give me a week. Hair is overrated. Hi, are your batteries in your back pack? I would imagaine it’s more comfortable to have them mounted on the bike. Just wondering your thoughts on that. In the snow, I always use a backpack because it eats so many watts. On trails for less than 90 minute rides without snow I use frame packs.